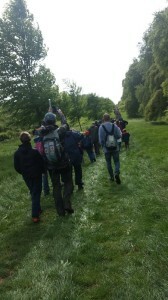 O n Saturday (10th May) Beavers (aged 6-8) from Poole completed a 3 mile hike on the Kingston Lacy Estate, which took in the lovely view of the surrounding area and Badbury Rings themselves. This event was open to all the Beavers in Poole and their families so we had everything from children being carried in swaddling & toddlers walking to older siblings & grandparents. We had a turn out of over 260 people this year which is a new record! The walk took the Beavers and their families along the Beech Avenue heading back towards Wimborne and then up the hill alongside some lovely fields towards Kings Down Farm. All the Beavers were excited to see some cows peacefully grazing and thankfully they did not mind us passing them at all. We then went through the woods for a while and back down a narrow, rather muddy track back down to Badbury Rings where we had some photo’s and a very quick picnic as the rain was in the distance and seemed to be approaching rather to quickly for our liking! To see the route we took see this National Trust route card. This even was part of JOTT (Jamboree on the Trail) where Scouts from all over the world hike on the same day. We are all looking forward to next years JOTT, where do we try next?